It isn’t so much relaxing as it is silly and…well, a bit liberating. Bathing in a mud bath, enjoying a mud fest, laughing at the “tar-babies” next to you, goes against all those years of trying to stay clean. The best mud can only be found in certain spots—not just on any old river bank. 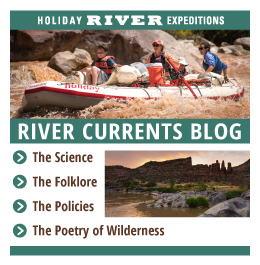 On Cataract Canyon, our mud club was founded at the confluence where the Colorado River meets the Green River. The kids and our guide, Kevin (a kid disguised as an adult), discovered the kind of mud that could be jarred and sold to high-end spas with the right marketing. This area, believed to be the “center of the universe” by the Ute Indians, transformed us into bathing mud beauties and beaus…until we jumped into the warm water for a final cleansing. 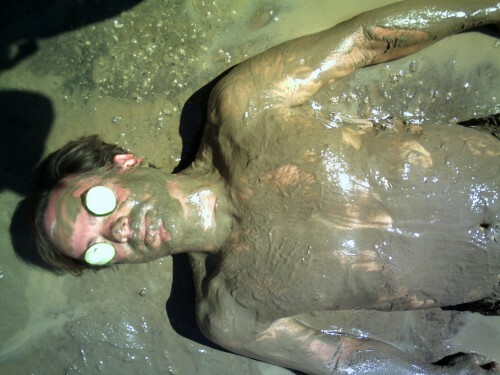 A lasting memory will be Kevin finishing off his mud spa with two sliced cucumbers over his eyes—people pay a lot of money to get this dirty.